Every day, my cat looks up at me with her adorable yellow eyes and says what I believe translates to "That sure is a nice everything-on-the-table you have there. It'd sure be a shame if something happened to it." Then the chaos begins, and the inevitable pull of gravity takes over as she pushes pens, cups, and anything else she can see to the floor. Maybe I'll finally understand why when Catlateral Damage comes out. 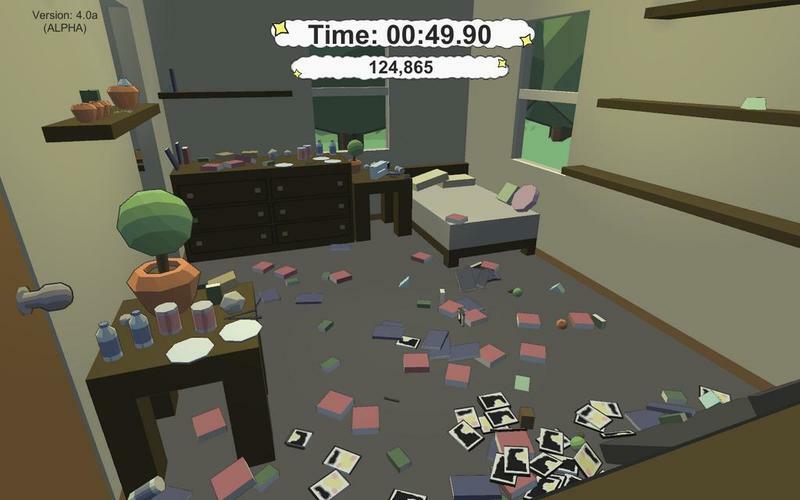 Created by programmer Chris Chung in the Unity engine, Catlateral Damage came out of a recent game jam called 7DFPS. Chung knows a good concept when he sees one, though, and has already created a Steam Greenlight page for the game. Coming in the final release are more rooms – a full house worth of them – more objects to swat at, better graphics and new gameplay modes (Cat Ops and Free Mode, so far). My hope is for a mode that simulates what my cat does: Push stuff off until your foodgiver-ape comes near, then dash. Game over if you get picked up, bonus points for a well timed meow that reminds the hairless giant how adorable you are. We here at the Internet love our cats, so a game simulating what a bunch of jerks cats are is a surefire hit.